History was made with Hillary Clinton officially declared the Democratic presidential candidate for 2016. This historical moment is being put into context by numerous historians, newspapers and writers through discussions of previous female presidential nominees in the U.S.
Recognizing the women of the past who ‘opened the way’ (see what I did there? ), means a shout out to our own radical feminist Victoria Claflin Woodhull. Recently, WNYC broadcast a short clip titled: “Before Hillary Clinton was ‘The Devil,’ Victoria Woodhull was ‘Mrs. Satan’” — in reference to the political cartoon from the height of Victoria’s unpopularity. “Get thee behind me, (Mrs.) Satan!” Library of Congress Prints and Photographs. If you have 6 minutes, I highly recommend this short program sharing some historical details about Victoria’s 1872 nomination for president under the Equal Rights Party platform. Ultimately, it didn’t go far — let’s [with bias] blame that on her rivals Henry Ward Beecher and his supporters — but she was the first woman to be nominated. I would also, however, suggest reading further into Victoria’s life, particularly the importance of her sister, Tennessee Celeste Claflin, whose constant support of Victoria is overlooked within this brief history. And then follow that reading up with some information on Belva Lockwood, the first woman to run and campaign for president in 1884 and 1888. 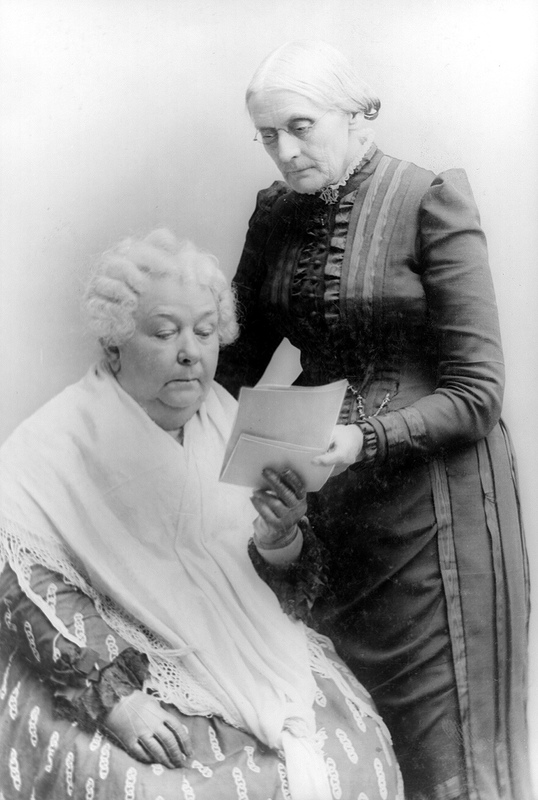 By the way, Victoria and Belva ran for president over 30 years before women were given the right to vote. The third stop on our tour is located at the Manhattan side pedestrian entrance to the Brooklyn Bridge. 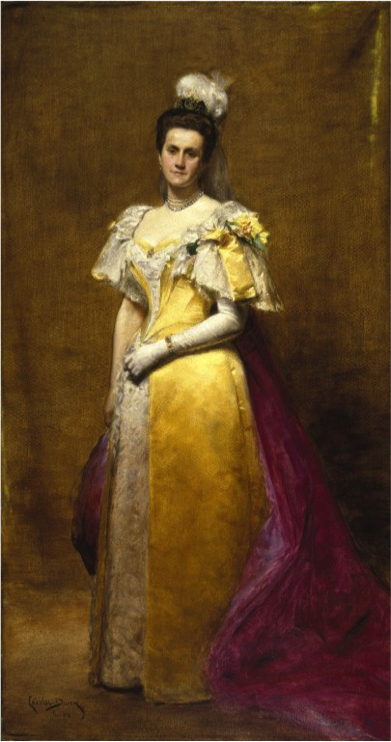 There, we highlight the woman behind this monumental construction, Emily Warren Roebling. construction. Already a well educated woman, she further expanded her knowledge by studying mathematics and bridge engineering to competently manage this critical role. She and a coachman had crossed over from Brooklyn in a new Victoria, its varnish gleaming in the sunshine. She had taken a live rooster along with her, as a sign of victory, and from one end of the bridge to the other, the men had stopped their work to cheer and lift their hats as she came riding along. 130 Years Of Brooklyn Bridge Photos, Decade By Decade, Curbed New York. Brooklyn Bridge History and Photography, James Maher Photography. Extra Historical Connection! : Another famous nineteenth-century figure was present at the Bridge’s opening, President Chester A. Arthur. At the age of 24, long before he was president, Arthur was a junior partner at the law firm hired to represent Elizabeth Jennings (Opening the Way’s sixth stop) in her suit against the Third Avenue Railroad Company for racial discrimination. He was the lawyer who successfully represented Jennings, resulting in an 1855 ruling by the jury to award $225 in damages and setting a precedent that aided the desegregation of New York’s public transportation in 1861. FROM OUR ARCHIVES: ORIGINALLY POSTED FRIDAY, MAY 23, 2011 ON WEWALK: BEHIND THE SCENES OF OPENING THE WAY. EDITED AND UPDATED ON 5/23/2016. On this day in women’s history, we celebrate the birth of Margaret Fuller, a woman whose name is associated with several important contributions to American history. Fuller was born on May 23, 1810 in Cambridgeport, Massachusetts to Unitarian parents, and received a strong classical education from an early age, becoming well-versed in languages such as French and German. She became a passionate advocate for transcendentalism, a philosophy that developed as a critique to the state of ideas in society and at Harvard in particular. A core belief of transcendentalist philosophy was the belief in an ideal spirituality that goes beyond the physical and empirical and is fulfilled only through a person’s intuition rather than organized religious doctrine. It affected literature, poetry, art and music from about 1835-1880. Fuller worked with prominent figures such as Ralph Waldo Emerson, Henry David Thoreau, and Walt Whitman, and gained a respected reputation in this field, becoming the first editor of the transcendentalist journal The Dial in 1840. In 1844, Fuller came to New York to work for Horace Greeley’s New-York Daily Tribune, one of the most influential newspapers in the country. There, she became the first full-time female book reviewer in America. She was considered one of the most well-read people in New England, and became the first woman admitted to use the library at Harvard College. In 1845, she published Woman in the Nineteenth Century, which is considered the first major feminist work in the United States. 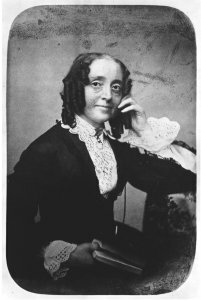 The book was based in part on a series of “Conversations” or seminars she had held for women social reformers while in Boston, to compensate for their lack of access to higher education. In 1846, Fuller left for Europe as the Tribune’s first female international correspondent. She settled in Rome and covered the Italian revolution. She had a son with Giovanni Ossoli, whom she married; and the three of them left on a ship on May 17, 1850 to return to America. But en route to New York, their ship was wrecked in a storm and the family tragically perished. Margaret Fuller died at only 40 years old, but left a legacy in which she is considered one of America’s first feminists. She fought fiercely for women’s rights, particularly in the areas of education and work. On May 25, 2011, she was celebrated through the Margaret Fuller Bicentennial Celebration, in Boston. FROM OUR ARCHIVES: ORIGINALLY POSTED FRIDAY, MARCH 25, 2011 ON WEWALK: BEHIND THE SCENES OF OPENING THE WAY. EDITED AND UPDATED ON 3/25/2016. Today, March 25, marks one of the most significant days of the year in women’s labor history. It is the 105th anniversary of the Triangle Shirtwaist Factory fire—the largest workplace disaster in New York up until the World Trade Center attacks. It sprung into action a labor rights movement to enable fair and safe workplace conditions in the twentieth century. This momentous fire is included in our women’s history walking tour as the turning point in one particular woman’s career and life: Frances Perkins. Library of Congress, The shirtwaist style, as depicted in a June 1896 Scribner’s Magazine. 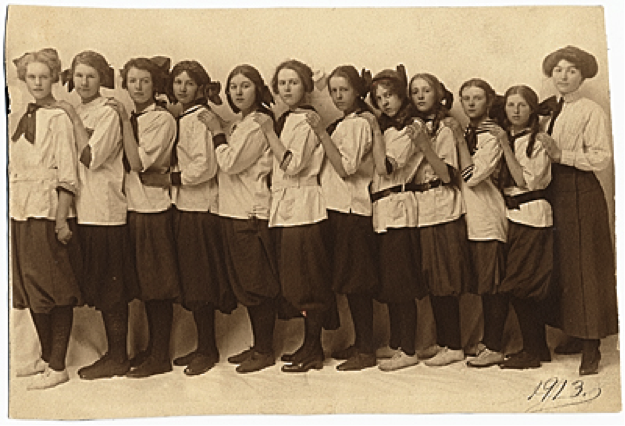 The Triangle Shirtwaist Company specialized in the popular “shirtwaist” which the New York Times blog describes as a “brash but sensible pairing of tailored shirt and skirt” that offers a scandalous peek of its owner’s ankles. It was preferred by women of the day for its utility, as opposed to the longer, more confining dresses that they watched their mothers wear. Located one half-block east from Washington Square Park in Greenwich Village, NYC, the Triangle factory was the largest producer of shirtwaists in the city. It packed hundreds of young female seamstresses close together on the top three floors of the Asch building, compelling them to work long hours for $5 or less per week. The infamous fire took place towards the end of the work day on March 25, 1911, when somebody tossed either a lit match or cigarette into a waste basket. It spread rapidly as it caught to the scraps of fabric hanging overhead, and workers scrambled to escape. But the doors had been locked to prevent them from stealing or leaving early, and fire ladders could only reach the sixth floor, whereas most workers were on the ninth floor. (The owners, who were on the tenth floor, were notified by telephone and got out safely, as did other high executives.) Onlookers watched in horror as more than 50 people jumped to their deaths. An additional 19 people fell into an empty elevator shaft, 20 fell from a fire escape, and at least 50 burned to death. The fire ultimately killed 146 people, all but 23 of whom were young (mostly immigrant) women. Frances Perkins, advocate for safety. One of the onlookers was Frances Perkins, a social worker who was having tea in Washington Square Park across from the factory. The fire motivated her to later become one of the most important advocates of reform, and she was named executive director of an organization that formed as a result of the tragedy, called the Committee on Safety. New York State subsequently passed the strongest workers’ laws in the nation and became a role model for other states. It began to mandate automatic sprinklers in high-rise buildings, fire drills at large companies, and factory doors that swung outwards rather than inwards. It established minimum wages and maximum hours, and demonstrated that the state indeed has a responsibility to protect its workers. For the 105th anniversary, commemorative events seek to keep the tragedy fresh in our minds, while resources exist preserving the history year round. Although this fire eventually resulted in the U.S. improving labor laws, garment work continues to put people at risk in other parts of the world. FROM OUR ARCHIVES: ORIGINAL POSTED TUESDAY, MARCH 8, 2011 ON WEWALK: BEHIND THE SCENES OF OPENING THE WAY. EDITED AND UPDATED ON 3/8/2016. Today is International Women’s Day, which highlights the accomplishments of women around the world while bringing awareness to their ongoing plight. On this day, March 8, we encourage activists to educate themselves and others about women’s history in order to emphasize the struggles women have overcome in the past and the important contributions that they have made when given the opportunity. The United Nations describes International Women’s Day as “the story of ordinary women as makers of history.” It is rooted in a tradition where women worldwide hold a common oppression in political, economic, and sexual subordination due to their gender, but the origins of Women’s Day differ in various parts of the world. The first National Women’s Day was celebrated by the American Socialist Party on February 28, 1909, and American women continued to celebrate it every last Sunday in February until 1913. Likewise, in 1910, the Socialist International proposed an International Women’s Day to help win suffrage and other rights for women, which was unanimously accepted by countries such as Germany,Denmark, Austria and Switzerland. On March 8, 1917, Russian women protested the czar under a “Bread and Peace” strike and won the right to vote from the provisional government four days later, after the czar was abdicated. The UN subsequently began celebrating IWD on March 8 in 1975, and passed a resolution two years later to proclaim a Day for Women’s Rights and International Peace. Since 1987 in the US, March has been designated Women’s History Month, embracing the pre-existing calendar day long dedicated to women. Around the world, it has become a symbolic moment when groups gather, rally, and inform to declare that historically women have been left out of the narrative, but we’re working hard to rewrite those stories. Click here for a shameless Opening the Way tour plug! Join an event, share a meme, sign a pledge, spread the word. To see what events are going on, Internationalwomensday.com has an event finder based on your location. 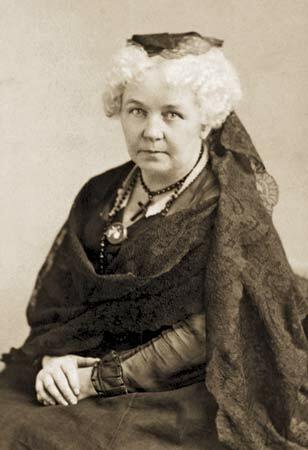 Happy Birthday to Elizabeth Cady Stanton! her spirit has never been more alive. Stanton, called the Unwavering Campaigner, joined up with her close friend, Susan B. Anthony, and the two tirelessly campaigned for U.S. women’s suffrage throughout the 19th century. The countdown to the 100th anniversary of their ultimate victory has begun, and her heirs in the women’s political power movement honor Stanton’s strategies and still look forward to the day when the U.S. Senate has 51 women and the U.S. Supreme Court is five women and four men. So start looking out for celebrations. Although Stanton died without seeing women granted the right to vote, she remains, along with Anthony, one of the best known American suffragists. At Women’s eNews, we are particularly proud to use our women’s history walking tour to share her work with Anthony from 1868-1870 publishing a newspaper called The Revolution. Women are often defined by their lifecyles: wife, mother, widow. I would prefer to define Stanton by her tenacity. Her life-long dedication to social and gender equality began at a time when very few people were listening. “Men, their rights and nothing more; Women, their rights and nothing less.” — the motto of The Revolution. We can take comfort in knowing that these last 200 years would not have weakened her resolve. ‘My mother, my mother!’: A casual encounter with NYC’s Mayor. It was a bright sunny Friday morning when we started out on our walking tour with a group of college students from Long Island. As we waited to cross the street from the west side of Park Row to the east, Rita –Founder & Editor in Chief of Women’s eNews as well as an Opening the Way guide — noticed someone else on the corner. 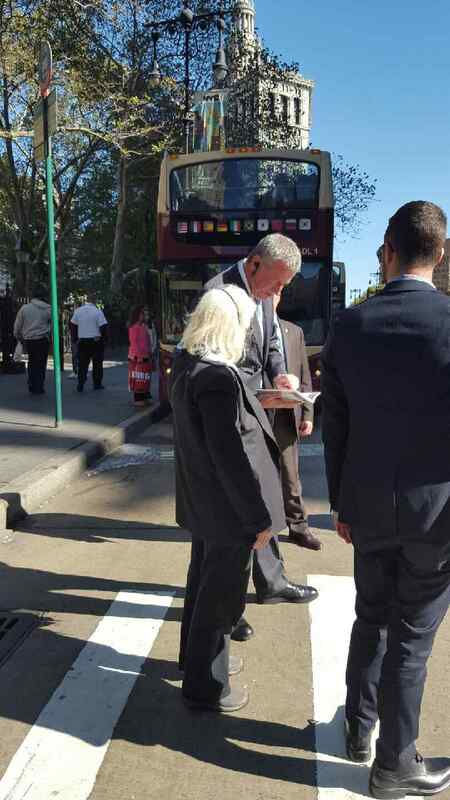 Rita Henley Jensen and Bill de Blasio on Park Row, Friday Oct 23, 2015. New York’s Mayor Bill de Blasio, only a block from City Hall, was casually blending in to the city’s pedestrian traffic. Thanks, Bill! We plan to! Happy September 23rd birthday to 3 of our Opening the Way women! It seems almost too much of a coincidence, but September 23rd is the known date of birth for three pioneering women featured on our women’s history walking tour: (in order of birth) Victoria Claflin Woodhull, Emily Warren Roebling, and Louise Nevelson. On our tour we highlight the great achievements of each woman: Victoria’s stop reveals that 111 Nassau was the location of her and her sister, Tennessee’s, newspaper, Woodhull & Claflin’s Weekly; Emily is forever memorialized with the Brooklyn Bridge; and Louise’s sculptures, Shadows & Flags, stand tall on her namesake plaza on Maiden Lane. Still, the linking date September 23rd made me wonder what else these women had in common. I was surprised that it was not family background or motivations. So I did some research into their childhoods. My inquiry centered on the question whether there was a similarity in their upbringings that caused Victoria, Emily and Louise to fight back against gender norms and expectations, and create lasting legacies of feminist leadership. Victoria Claflin, born September 23, 1838 in Homer, Ohio, was one of a large, unstable and impoverished family. Married at just 14 years old to an older man named Canning Woodhull, a physician and alcoholic, Victoria was exposed to hardships from a young age. Victoria, Tennessee and the other Claflin children were taught to be clairvoyants, spiritualists, and “healers” and put to work by their parents to contribute to the family income. Victoria and Tennessee were incredibly close and worked side by side as clairvoyants, stockbrokers, writers, publishers, activists, campaigners and suffragists. Their reputations, especially in their early years, were scandalous. They relocated several times to avoid prosecution and the bad reputations that accompanied them. But it was these early experiences that caused them to be so extraordinary. Victoria divorced her first husband after eleven years of marriage, and went on to marry two more times in her long life. She was an active campaigner for divorce, free love and female independence. The ideals she championed as an adult mirror the confining experiences of her childhood. Emily Warren’s start in life had little in common with Victoria’s. Born in 1843 and raised by a successful, though also large, family in Putnam County, NY, she had the luxury of a childhood, unlike Victoria. They did have one important similarity: the devoted love of a sibling. The eldest brother, Gouverneur Kemble Warren took his younger sister under his wing and paid for her academic education. As a civil engineer and general in the Union Army he lived in Washington D.C. He enrolled Emily in Georgetown Visitation Convent to study history, geography, French, English, mathematics, and of course the domestic skills of housekeeping, tapestry and piano. It was Kemble who introduced Emily to Washington Roebling, who she married in 1865. Arguably it was the support and encouragement by her brother that enabled Emily to complete the Brooklyn Bridge and forever preserve the Roebling name in engineering history. Decades later, at the turn of the century, Louise (Leah) Berliawsky, was born in Ukraine, although September 23rd 1899 was her chosen birthday. The Jewish family immigrated to Rockland, Maine when Louise was five years old. They brought with them the skills of their family business and started a successful lumber company. But Louise always knew she wanted to be an artist. And it was the forest environment, specifically wood, that inspired and mediated her early artwork. Unlike Roebling, Louise’s family did not support her ambitions of life as an artist. At the age of 21 she married Charles Nevelson and had her son and only child quickly after. These brief accounts expose that there were few similarities in the upbringings of Victoria, Emily and Louise. In fact, the only thing that these three women did have in common came about after their childhoods, when they reached an important stage in women’s life cycles: marriage. But it wasn’t the marriage itself; it was their move to New York City. Victoria was 30, Emily was 26 and Louise was 21. The City provided them with unique opportunities on a grand metropolitan scale. It gave them the platform to thrive. All three took the best traits they had gained in their early lives to carve a niche for themselves in New York City. Victoria Claflin Woodhull: National Women’s History Museum; Encyclopaedia Britannica- Victoria Woodhull; M. M. Marberry, Vicky: A Biography of Victoria C. Woodhull (New York: Funk ôtWagnalls, 1967); Emanie Sachs, “The Terrible Siren”: Victoria Woodhull, 1838-1927 (New York: Harper, 1928). Emily Warren Roebling: Roebling Museum; American National Biography Online; Scandalous Women Blogspot. Louise Nevelson: The Art Story; Encyclopaedia Britannica- Louise Nevelson; The New York Times Obituaries- Louise Nevelson Sculptor is dead at 99, 04/19/1988; Louise Nevelson Foundation. We’re putting on our walking shoes and filling our water bottles. On Women’s Equality Day (it’s Wednesday, August 26) Gloria Feldt, co-founder and president of Take the Lead and I, founder and editor in chief of Women’s eNews, will lead a very special women’s history walking tour in downtown Manhattan. We have invited guests from both organizations and many have accepted for this first of a kind meet-up. Together, we will celebrate the women who took the lead as far back as the 1800s and agitate for completion of their agendas. Gloria Feldt and I came of age in the late 50s and early 1960s in places as different as they could be: she in Tempe, Texas, and me in Columbus, Ohio. Yet, Gloria and I have much in common, including a passion for women to take their rightful place in the halls of power. We both married young, as was expected, and became mothers while still in our teens. Then the 1970s happened to both of us. In a very much unexpected reach forward, she enrolled in University of Texas of the Permian Basin; I enrolled in Ohio State University in Columbus. Then the women’s movement happened. To both of us. And it changed our lives forever and led us both to opportunities for leadership. After graduation, Gloria joined Planned Parenthood in West Texas and quickly rose to management, becoming in the 1990s CEO and president of Planned Parenthood Federation of America, and became America’s top advocate for women’s reproductive rights as well as head of the nation’s largest provider of health care to women. She retired, wrote a book on leadership and founded a new organization to fill a need as important as reproductive health care: Take The Lead. Through Take The Lead Gloria encourages women to strive for parity and reduce the gender imbalance in leadership positions by the firm deadline of 2025. I ended up with a degree from Columbia University’s Graduate School of Journalism and a member of the first class that was 50 percent female. (Now, it’s closer to 70 percent female.) I pursued a newspaper journalism career, but always with the profound understanding of women’s issues and public policy. In 1990s, I realized in a way I hadn’t before that the practice of most news media was to treat women’s issues with disrespect and to the point of being harmful to women and girls. I decided I needed to change that. My vehicle became launching and leading Women’s eNews in 2000 a daily nonprofit news organization that has changed the nation’s media landscape. Both of us, through our experiences, are acutely aware of the common definition of power, one that Gloria wishes to flip on its head and I wish to catch and carry forward. “The archetype of power,” Gloria says, “is male and outdated. It was defined as ‘power over.’” That is a turn-off for women, she says, and women are attracted by the “power to.” The difference for example, would be a corporate executive who has the power over who receives a bonus and commands deference and one who ensures the team is paid fairly and commands respect. On the walking tour, we will make stops recalling women who used their “power to” improve the lives of women and girls and be reminded that each of us has the “power to” make change for women and girls. The first stop, fittingly enough, will be the site where the founder of Planned Parenthood Margaret Sanger was indicted for sending a newsletter through the U.S. mail that promised to deliver information about birth control. In 1921, Sanger founded the American Birth Control League (later renamed Planned Parenthood), and two years later opened a legal doctor-run clinic for women in Manhattan. Next: A half a block from where Sanger was indicted, we will pause at the Elizabeth Cady Stanton and Susan B. Anthony corner. These long-time partners in the suffrage movement were the writers and publishers of a weekly newspaper, The Revolution (1868-1870). Stanton is also author of “Declaration of Sentiments and Resolutions” (1848). Anthony was arrested in 1872 for voting in the Presidential election. Crossing Park Row, we will stop by Elizabeth Jennings corner. In 1854, she created the template challenging segregation of public transportation. She refused to leave a “whites-only” New York City trolley and successfully sued for damages. We will next stand where Joseph Pulitzer made history with such journalists as Emma Bugbee a feminist who covered women’s issues and in 1912 marched with the suffragists from New York City to Albany insisting on their right to vote. Down historic Nassau Street, Victoria Claflin Woodhull published a weekly newspaper and launched her 1872 presidential campaign. Unfortunately, she was in jail at the time for publishing the details of prominent minister Henry Ward Beecher’s affair with a married member of his congregation. The next stop is often a favorite of Girl Scouts. Augusta Lewis, in 1868, organized a labor union for female typesetters to protect women hired and fired as union-busters. She wrote a letter to the national union asking for admission for her all-women local, arguing that women and men should earn the same pay for the same work. A few blocks south on Cedar Street, we recall the journalistic powerhouse that was Ida B. Wells. Born into slavery, Wells rose to national prominence as the journalist who brought to national attention the all-to-common practice of the lynching of black women and men. Women’s eNews honors a journalist each year with the Ida B. Wells Award for Bravery in Journalism. After we pass the site where Occupy Wall Street camped, we stop where Frances Perkins held hearings into the causes of the 1911 Triangle Shirtwaist Fire. She was the first woman to be appointed to a presidential cabinet position. As Franklin Delano Roosevelt’s Secretary of Labor, she is now known as a major architect of the New Deal. At St. Paul’s Chapel, we stop to remember the female first responders who died on September 11, and to honor Captain Brenda Berkman, a first responder on September 11 and a member of the first class of New York City firefighters to include women, the result of her complaint against the department for gender bias. She won by demonstrating that the required qualifying exam was almost impossible for women to pass. Gloria and I are thrilled that we have this opportunity to join forces and introduce so many to these women who opened the way and led by example. On Women’s Equality Day, August 26th, join Take The Lead and Women’s eNews for an evening of leadership focused empowerment! 7:00 pm: Women’s history walking tour celebrating pioneering women who exemplify the effort to create gender equality using agency, power and leadership. The walking tour stays within the local area of Downtown Manhattan, leaving from Women’s eNews HQ and ending at St. Paul’s Chapel (Fulton Street and Broadway). Learn about Ernestine Rose, a leading Jewish feminist of the first wave movement who campaigned for married women’s property rights! Hear the story of Elizabeth Jennings, the first African American to bring a successful lawsuit against race discrimination on public transit in New York City. 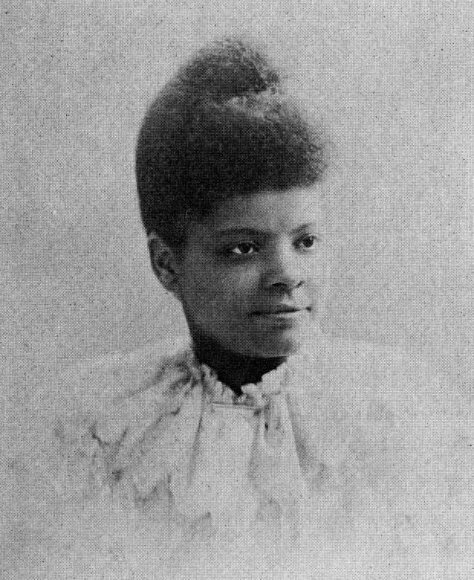 Visit the street where Ida B. Wells’ refused to be intimidated, and had her controversial article published despite mobs burning down her newspaper in Memphis, TN.